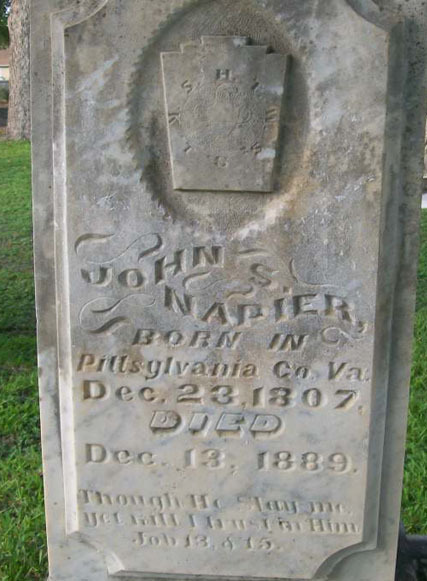 Born December 23, 1807 in Virginia, John Napier spent his childhood in Tennesee and Alabama. In the latter place, he received the best available education at what was then called La Grange College prior to it becoming Florence Wesleyan and ultimately, North Alabama University. At least a dozen early 92 men attended the same college. After graduation, he went to Princeton College in Kentucky where he studied medicine but most of his life was spent farming. During the 1850s and 1860s, he was living in La Grange, Alabama where he served on the Board of Directors for his alma mater while 92 men such a Sul Ross attended. Napier also tended to 30,000 acres of farmland until the end of the Civil War when he moved off to Waco. In May of 1868, Napier purchased the log cabin only just completed by Brother Earle and then expanded it to the large home it still is today. He lived there for the remainder of his life and eventually his daughter, Sarah Napier Kinnard, inherited the home and maintained it as her father had built it. Thus, Brother Napier is the sole link to all three of the names the historic home and museum bears today. When Brother Napier died and was buried at Oakwood in 1889, his gravestone made sure to mark his loyalty to the Masonic fraternity for all to see. His son, John Napier Jr., was also a member of our lodge. The younger Napier was a Railway executive and settled in Vernon, Texas. A town called Napier and located northeast of Houston was named after him. It was absorbed by Shepherd but there are still visible remnants of Napier today.